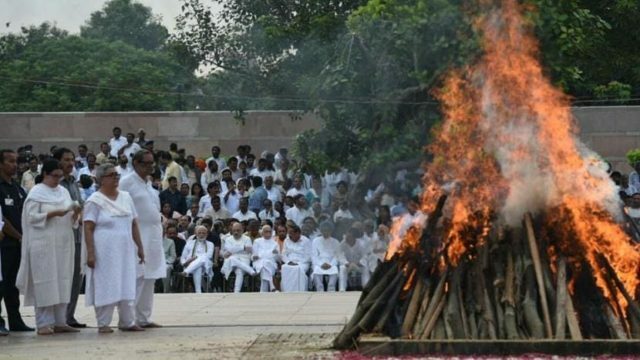 New Delhi: Former prime minister Atal Bihari Vajpayee was cremated with full state honours at Rashtriya Smriti Sthal on the banks of river Yamuna in Delhi today. President Ram Nath Kovind, Prime Minister Narendra Modi lead the nation in offering condolences. The late politician’s adopted daughter Namita Kaul Bhattacharya lit the funeral pyre and the BJP stalwart was given a gun salute. Last rites of Bharat Ratna and former Prime Minister Atal Bihari Vajpayee performed with full state honours at Smriti Sthal in the National Capital on Friday; Foreign dignitaries from Nepal, Bhutan, Bangladesh, Sri Lanka and many other countries attended the last rites. Earlier the mortal remain of Vajpayee was shifted from his residence to the BJP headquarters this morning, where scores of politicians paid tribute to the late leader through the day. Later his body was brought to Smriti Sthal amid lakhs of mourners with Prime Minister Narendra Modi and BJP chief Amit Shah walking beside the flower decked gun carriage. Vajpayee retired from active politics in 2005, a year after the BJP-led NDA lost the Lok Sabha elections. He became the prime minister for the first time in 1996 but was in power for only 13 days after the NDA failed to secure a majority, forcing him to resign before the vote of confidence. He took over as the Prime Minister of India for the second time in March 1998 but lost a trust vote in October 1999. A Poet, a Journalist, a politician and then the prime minister of the country, former prime minister Atal Bihari Vajpayee has been a man of may virtues. He belonged to that rare league of politician who find love and respect equally among their friends and rivals. Born on 25th December 1924 in Gwalior, Vajpayee became president of Jansangh before becoming founding president of Bhartiya Janta Party. He became Prime Minister of the country thrice and gave the nation a strong and prosperous journey through his regime. He was the first Non Congress Prime Minister whose government could complete 5 years of tenure. His charismatic leadership ensured that NDA government with its 23 alliance from across the country not only ran successfully but also complted its term. A brilliant orataor, and a strong leader Vajpayeeji had heart of an emotional poet. Born on December 25, 1924, in Gwalior, Madhya Pradesh Vajpayee has a long parliamentary experience spanning over four decades. He was first elected to parliament in 1957 and was an active member of the parliament till 2004, when he was re-elected from Lucknow for a record 5th time. He was elected to the 5th, 6th and 7th Lok Sabha and again to the 10th, 11th 12th and 13th Lok Sabha and to Rajya Sabha in 1962 and 1986. He is the only parliamentarian elected from four different States at different times – UP, Gujarat, MP and Delhi. The vagaries of alliance politics didn’t, however, stop him from undertaking a calculated decision of going ahead with the Pokhran Nuclear tests. Undeterred by the threat of sanctions or political alienation in the world fora, Vajpayee’s conviction stood him good as India registered its Nuclear prowess and also underlined its ability to withstand sanctions, economic or otherwise. The same belief was apparent when he chose to address UN General assembly in Hindi. Known for his political acumen, he proved that he had a deep sense of economic foresight when he started his ambitious Golden Quadrilateral project. He is credited with doing all the groundwork that pitchforked Indian economy with a sustained growth year after year. Few Indian Prime Ministers have left such a dramatic impact on society. His presence in Parliament during debates meant that the reply or the intervention will have all the elements of his trademark style and demeanor. He was opposition leader for 40 long years, but that length of time didn’t leave any regrets or frustration. Rather it enriched him with friends and admirers spanning across the political spectrum. Even the most vocal BJP opponents deployed carefully drafted words bordering on silent admiration when they had to give opinion on him. Atal Bihari Vajpayee, a life time spent in politics, a life dedicated to nation, a life journey characterised by caravan of admiration and friendship.